All interested researchers, students and faculty from local research organizations are invited to attend. Biodiversity science integrates processes across varying temporal and spatial scales. The use of remote sensing techniques utilizing datasets from Earth-orbiting satellites to characterize and monitor biodiversity across broad, remote and logistically challenging ecosystems is emerging as a promising approach for supporting biodiversity assessment with the potential for significant breakthroughs in associated biological and Earth sciences. 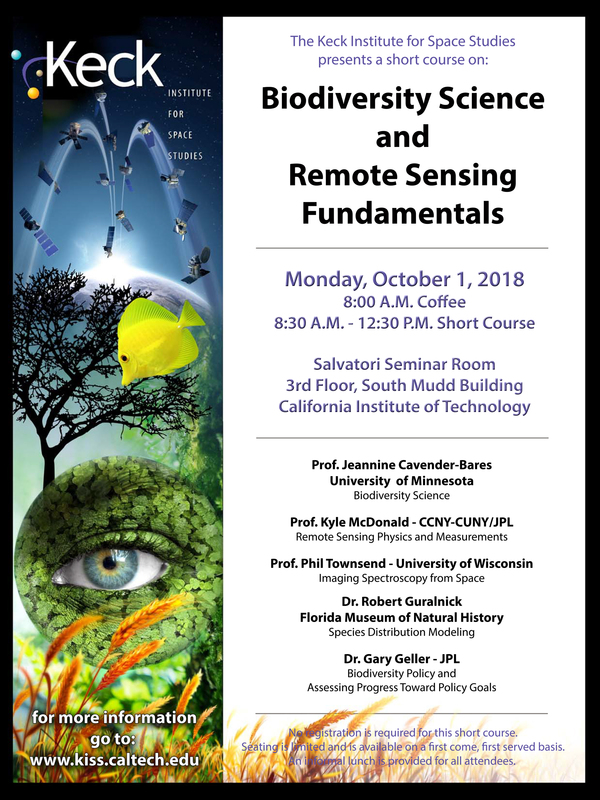 This short course will cover fundamentals of biodiversity science, associated biological concepts, and species distribution modeling, and will discuss the utility of remote sensing measurements for supporting biodiversity science. Remote sensing technologies discussed include imaging spectroscopy, microwave sensors, lidar, and SIF. The course provides an introduction to critical fundamental concepts and technologies for science policy as related to biodiversity science. An informal lunch will follow for all attendees. Seating is limited and is first come, first served. Please make sure to only park in unmarked spaces or, if parking in the structure, park in spots marked "commuter." JPLers: Use your JPL hangtag. Visitors: Buy a parking permit.